Search, Seek, and hopefully find. Lots of options – many paths. I started reading it because of the title “Empowered Storytelling” – I am ALWAYS looking for ways to help me figure out how to tell the story of The Botanical Beauties & Beasties. But of course, the piece was about a different kind of storytelling. It was about our own life tales/stories. A good topic-I often wonder just how many more times I am going to be “reinventing” my story? I recently realized I am not necessarily “reinventing,” I am just trying to get the story adjusted to the route I would like. Never easy, but I feel worth the effort. It would be MUCH easier to go along and ‘bounce’-but I am trying for a conscious path. 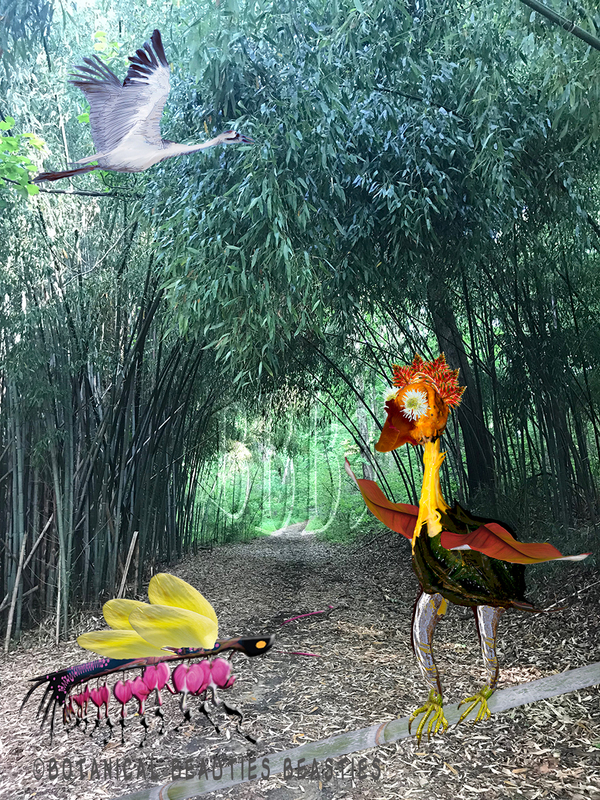 I choose the image above left for it is definitely about paths: It is right here where I live, I added Beau for he is Minister of Wisdom, Gordy for he is a local artist and the recent sketch I created of an Maryland Whopping Crane flying in the trees-seems to cover the bases! “We all have our own life story. It is filled with relationships and events that help shape who we are and what we believe to be true about the world. Depending on our perspective and willingness to grow, our experiences can become fodder for negativity and patterns of playing the victim, or they can fuel a life of empowerment and continued self-development. It is the story we tell ourselves about what happens that makes all the difference. Take a moment to look at the life story you create for yourself on an ongoing basis. If you generally feel peaceful about the past and trust in your ability to handle whatever comes your way, then you are framing circumstances in a manner that serves you well. On the other hand, if you retain a lot of guilt or resentment and often feel weighed down by life, you may want to start telling yourself a new version of past and present events. No matter who the characters are in your story or what they have done, you are the only one who can give their actions the meaning they will have for you. You are the only one who can define what role you will play in your own life. By taking responsibility for your story, you are able to learn and grow, forgive and find compassion, and most importantly, move on into a brighter future.